Tickets to Sneak Preview #1 available here. 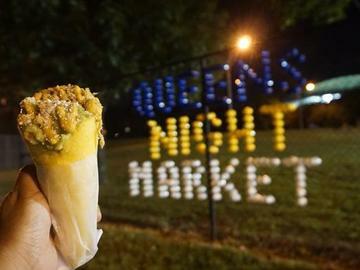 The Queens Night Market (queensnightmarket.com) will be free and open to all again starting on May 6th. WHAT TO EXPECT THIS YEAR: Food offerings include the always-popular Burmese palatas, Japanese takoyaki, and Romanian chimney cakes; and new entries include Valencian paella; Indonesian tahu magelang and kue pancong; Middle Eastern stews; Ecuadorian bollos and corviche; Barbadian fishballs; Nigerian jollof rice and puff-puff; crawfish pies and gumbo; Puerto Rican jibaritos and mofongo; Persian sweets and treats; and Macedonian relish. We still have a general $5 price cap on food, although a few vendors may be selling at $6. Art/merchandise offerings incude Quechuan handicrafts, NYC-theme apparel, Indian jewelry, contemporary art, emoji paraphrenalia, and henna. As always, we will have a great lineup of live music and performances, including the Neo-Blues stylings of Bette Smith, a cappella ditties from Concrete A Cappella, optimistic pop fuzz from Bridges and Powerlines, funky afrobeat from Gentleman Brawlers, and awesome tunes mixed by our resident DJ Lil Buddy. We'll be unveiling some new games and activities for visitors. And we will have our popular Beer & Wine Garden, so bring your IDs if you're interested in adult beverages! GETTING THERE: Due to extremely limited available parking, we encourage all visitors to leave their cars at home and commute, bike, or walk to the Night Market. We are located only four blocks from the 111th Street station on the 7-train. **Half of the ticket proceeds will go to the following three NYC charities. Please note all sales are final. The system does not allow us to cancel, refund, or reschedule.